Not surprisingly, nurse like to be involved in the turkey day process and make family a high priority. 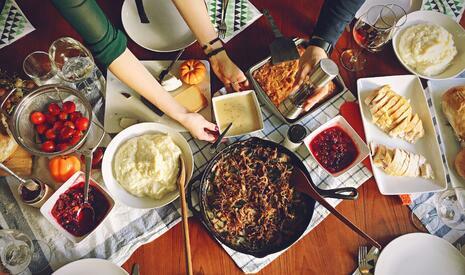 Our survey revealed that most nurses like to cook with family or friends as opposed to doing it all themselves, or showing up just to chow down. The more time spent with those special in their lives, the better! When asked what kind of meat they enjoyed on Thanksgiving, it’s no surprise that turkey was the most sought-after main dish by a landslide. As far as favorite side dishes, it was a mixed bag. Stuffing was the most popular response followed closely by sweet potatoes, green bean casserole and mashed potatoes. After getting a second (or third) helping, nurses enjoy a variety of pies. Pumpkin was the most popular followed by pecan and sweet potato. During cooking and catching up with loved ones, most nurses like having The Macy’s Thanksgiving Day Parade on the TV. Football was a pretty close second while many also enjoy football. A small percentage like The National Dog Show. One that caught us off guard was that only a few nurses keep the TV off during family time. In a word, family. When asked what they are thankful for, almost every nurse mentioned their family. Comments ranged from a simple nod to spouse and children, to beautiful write-ups on how important their family is in their lives. Many nurses also included mention of their extended family, noting friends and pets who are of significance to them. Additionally, several said they are thankful for their health and healthcare providers. Well, nurses, we are thankful for you. We hope you had a relaxing and meaningful Thanksgiving holiday with loved ones, and wish you a wonderful holiday season.